Here is a story that proves itself. Don Mikulecky writes about how Michael Mann has become a modern hero by being the target of active science deniers like Anthony Watts. And Anthony denies (twice) and in doing so proves (twice) how he instigates the lynch mob attacks against Michael Mann. Michael Mann was not someone who chose his role. Military persons can anticipate the possibility of being in situations where acts of heroism are called for. Scientists are certainly not in the same situation. Or at least, they have not been for a long time. Galileo comes to mind and it was the Church then that made his life one of great sacrifice. In these times the situation has deteriorated so rapidly that few of us have had a chance to evaluate the impact of what is going on. Science is a threat to the dark forces that are moving to control us all. People like Carl Sagan and Stephen jay Gould were out there early on fighting against these dark forces. They did a lot for us. Rachael Carlson and many others were on the front lines. Yet the situation with Professor Mann is something beyond all that. He has become a symbol for what our future is all about and he did not chose his role. No sane person would have. Watts Up with Watts' Memory? Note, this is a poll on the Daily Kos, one of the lefts most influential blogs, and there’s the result. Note that as far as I know, there’s been no freeping of the poll, and WUWT hasn’t mentioned it until Sunday night when I first was informed about it from Tom Nelson’s blog, nor have other climate skeptic blogs promoted this poll that I’m aware of, so I have to think this is what the Kos kids actually think of Dr. Mann. But Anthony did mention it - a year ago when the article first appeared! Kos asks about Michael Mann - hero or zero? ...And, there is a poll at the end which has some surprising choices. Anthony Watts posted about this over at his site and told the trolls to come and freep the poll. This is why year after year his site gets voted “Best Science Blog” or whatever. March 13, 2012 at 6:41 pm Thanks for pointing this out. Went over there to vote…. Please do the same. March 13, 2012 at 7:04 pm I think I’m dreaming. Or this is simply the most satisfying poll I will ever be allowed to be part of. Actually Willis, from the way the numbers jumped after this post, readers of WUWt ain’t buying it. Not quite the same thing. [self snip] I was given a tip, and didn’t realize that this poll is over a year old and didn’t recall WUWT had previously covered it. Neither did Tom Nelson when he covered it last night, so I withdraw this article as it is not new. You can get copy of Michael Mann's book from Columbia University Press or Amazon and probably elsewhere. It was with some glee that I noted books by Mann, Hansen and McKibben sell much better on Amazon.com than their rivals written by LaFramboise, Mountfort et al. 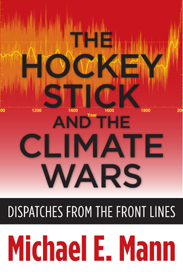 Mann's "Hockey Stick and the Climate Wars" is at #40,661, while LaFramboise is as #225,045 and Mountfort "The Hockey Stick Illusion" is at #130,410. Shows who is reaching the public that bit better. Good sales of the serious books by reputable and known authors doesn't surprise me. The denier stuff might fare better if it was classified properly (ie as pulp fiction). Um, I don't understand what your point is for this blog post. Is it that Watts does not remember something he did last year, or that he has a political bias, or what? I don't get your point. And then at the end of your post you try to sell some guys book. Wow. Welcome to my blog, Klem. Feel free to look around. Good science and reputable scientists like Professor Mann are treated with respect here, unlike your usual haunts.